Yes you do. Let me explain. You know I talk about them quite a lot but still some people are not quite sure why they need one. Let me explain. The whole principle of having a website and marketing online, and by the way having a website is marketing, it’s not just for the sake of having a website, but everything has to have a purpose. You will have paid either in money or in your time to create a website. Even if you make it yourself, that’s your time. So your website, needs to earn its money, and it has a choice of two ways of doing this. I’ve said before there are only 2 things, a non-government based website can do. The first one is it can sell stuff. Think of Amazon, think of my fireProtectionOnline.co.uk, if you desperately need a fire extinguisher or fire alarm system. Or, so that’s one. The other one is it can collect leads of potentially interested customers so that you can sell stuff to them later, when they need it because of all the people that arrive at your website. The vast majority are just looking for information or wondering checking you out, wondering who you are, finding out little more information about you. They don’t actually want something but the reason they want to check you out, find out about you is because they may want something. And they want to know a bit more. Or they may want something at a later date. So when they check that at midnight, when you’re fast asleep and its midnight Sunday and they’ve been working in their restaurant or in their pub or whatever it is, all day and they’ve just got home and it’s the only time they’ve got to check things like that out. You can’t expect them to leave a message on an answering machine because you are not going to be able to ring them back in the time they want. They don’t want to fill a form in because they want to know stuff right now. 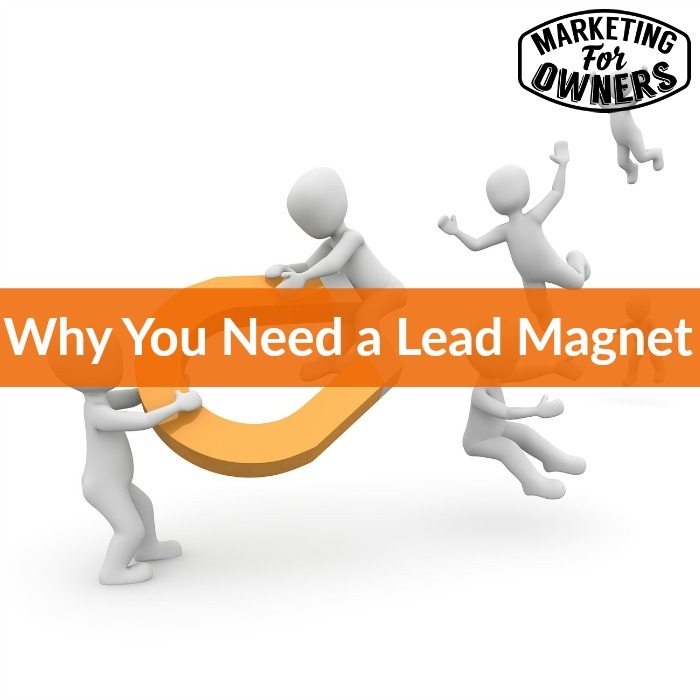 So what better way than to have a lead magnet? Now what that is — is some kind of process whereby you offer them something for free, completely free. As in that type of free, the one with no money. And in exchange they give you their name and email, or at least their email to get the free information so it maybe by download or instant access to it, something like that. Now this is permission marketing so what they are doing, they are giving you permission to market to them. If you’re doing it properly, you’ll be using an email service provider, someone like aweber or mailchimp. If you go to www.marketingForOwners.com/tools, then you’ll find it in the top menu, you’ll find resources and you’ll find link to aweber and mailchimp because they are the ones we use. There are others but we use them because we think they are the best. You need an email service provider like that to look after this. They look after the database, they send your emails for you, so it gets though spam filters and all that stuff. And then it complies with all the anti-spam acts all over the world because every email will have one of those one click unsubscribe links down at the bottom, or even at the top. Because people want to be able to get out of stuff they don’t want have to write to you and say, ‘Please remove me from your list.’ They want to just click. So lead magnets, what could you do? What could you provide? The most popular and easiest, not necessarily most popular but the easiest thing to do that works for any industry whatsoever is to give people a top five resource list. Now that means, generally the top 5 favorite tools that you use. If you are a painter and decorator, the top 5 tips and tools for getting a perfect job. For example, we all want to know how to cut in around windows, how do you guys do it? How do you do the straight line where the ceiling joins the wall? That kind of stuff. Do use some special type of paintbrush for certain things that we haven’t even thought of. Those kind of things. If you are a landscape gardener, what lawn mower do you use? What wheel barrow to use? And you think to yourself, ‘Who on earth wants to know that?’ Or you might think to yourself, ‘Well I use a professional lawn mower that cost $2000. No one wants to know that.’ Yeah, they do. They can’t afford to buy one but they can look at it and then they can try and find a cheaper version. They want to know. Doesn’t matter. They want to know. I want to know. You may be a printer. You can say the top 5 paper tips. What works well? We get quotes from printers and it says Matt, Silk or Glossy. And we may even get samples but we haven’t thought of things. What do we want to think about? What type of paper, don’t give us a list of choices. So tell us the top 5 paper tips. In fact if you are a printer, of course you can get peoples’ addresses and then send them out a sample pack of different types and different sizes so that they can know. Then you get their address as well. Clever, eh? But if you are a photographer, for example, people will still want to use you for their photography but you can tell them the top 5 ways to get the most out of your iPhone camera. They want to know you are an expert. They want to know you’re brilliant. They don’t know who you are up to this point, they want to be convinced that you’re fantastic and you know exactly how to do it. They don’t want to do it. That’s why they are looking at a photography site. They are not suddenly going to say, ‘Wow, I can go off at once and buy a few thousand pounds worth of gear and do it myself.’ They just want to know why you are good. If you are a fire protection tool, ‘Here are the 5 most popular fire extinguishers used by all our customers and why. Here are 5 combinations of Fire Fighting Equipment for the most common scenarios that we deal with every day.’ To help them choose. That kind of thing. Easy that would be one sheet. Now you’re thinking to yourself, ‘Oh, how do I produce that?’ and this is the thing. You just do it on word. If it’s a link, if you are sending them to amazon, if you’ve got those photography things, tell them where’s the best place to buy it. Send them a link. Link be to amazon, BH photo whoever it is. If its software tools, give them a link but write a little explanation. Just write it like a letter in Word and then save it as a PDF. That PDF can be linked, sent to upload it to your website and then it links in with the form for the lead magnet and it all gets delivered. We use lead pages for this. www.Leadpages.net, again if you go to that tool pages on the website, there will be a link but something like the FreeMarketingCourse.co. That’s an extreme version because that’s quite involved tool but it’s free. They are all videos, their all produce is completely free. Imagine how many people take that course. For those of you that have had my tools book, its, had been downloaded nearly 5000 times now. Actually saw one of my email. It says about three and a half thousand. It’s actually nearly 5000 times. You can go to www.MarketingForOwners.com/71 and get our tools guide. That’s got 71 of them in it. But we have got short ones. We’ve got 5 top books, my 5 favorite podcasts, my 5 favorite bloggers, my 5 top tools of all the 71. We’ve got another lead magnet that tells you the 5 top ones. You’ll find them dotted around the website. Please get yourself one of these reports. You need a lead magnet. You can then put a link to that on the back of business cards. When you give them out, people that aren’t even on your website say, look on the back, got a special think tip for you, go on our website, you can get a copy. Then turn their email in– they are in your email address. If they are not interested, they won’t even look. If they do look they are interested. They could be a customer. We’ll talk more about the lead magnets — don’t you worry!. There’s lot on the website about it. But I put it together in a 12 day course. It’s completely free. You don’t have to enter a credit card or an address or a phone number or anything. Just go to www.freeMarketingCourse.co. If you don’t like it, you can unsubscribe. They’ll arrive every day in your inbox and its video short form. You can watch it on a mobile or anything. It’s that good, and reports back. Say it’s quite well done. So what do you know, give it a try. It’s Thursday which means it is time for a Drive Time Podcast. So today I am sharing about a very very popular one, Tropical MBA. Now this has been around for a while. Its Dan Andrews and Ian Schoen. I am not actually sure how you pronounce that but you’ll find on the links on the website. 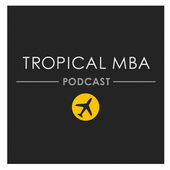 What they do, Tropical MBA is similar to Corbet Barr’s we mentioned a couple of weeks ago. Its location independent, so as you can imagine people all over the world. So more than bottom line profits as they would say. It’s broadcast every Thursday and it’s about half an hour. Very very good. I recommend it. Tropical MBA. I’ll see you tomorrow with a weekend challenge.